Earth Day is both an event and a movement. As a movement, it makes a difference, as an event, it is not to be missed. April 22 is Earth Day every year, no matter what the day of the week. It marks a significant anniversary in 1970 that is considered the birth of the modern environmental movement. Protests, social and environmental awareness, and activism of the 60s and the 70s were accompanied by surging gas prices, pollution and out-of-control consumption. In 1962, Rachel Carson published Silent Spring and it soared to the top of the New York Times bestseller list. Wisconsin Senator Gaylord Nelson, thought that if he could infuse the energy of the times with an emerging public consciousness about air and water pollution, it would force environmental protection onto the national political agenda. He proposed a “national teach-in on the environment.” Republican Senator Pete McCloskey joined him and Denis Hayes came on as national coordinator building a national staff of 85 to promote events across the land. See Frequently Asked Questions about Earth Day and its history here. 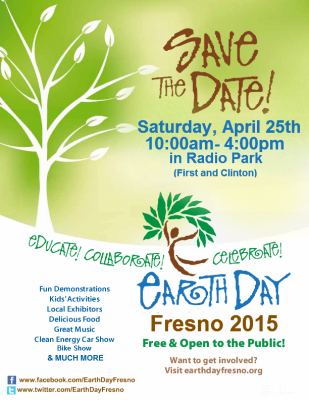 While Earth Day remains, April 22, on Saturday, April 25 Earth Day Fresno will host the Central Valley’s largest Earth Day celebration. Participants will include approximately 60 local agencies, business and non-profit organizations. For the first time, CMAC, the Community Media Access Collaborative, will be present to record the event and create a video for distribution. Earth Day happens because some major donors step up to the plate to make it happen. They are selected, invited, and recommended because they are walking the environmental walk. Underwriters: AgWell Solar, The Fresno Bee, San Joaquin Valley Air Pollution Control District, and Unitarian Universalist Church of Fresno. Sponsors: Republic Services and Mid Valley Disposal. Contributors: Fresno City Council District 7 – Council Member Clint Olivier, Community Medical Centers, Sierra Club Tehipite Chapter and SolarCity. “Join us as we celebrate Our Planet,” they say. •	The Fresno County Bicycle Coalition is having an “Earth Day Rolling Workshop and Fun Ride” that day, and members will arrival en masse sometime around noon. Renewable-Energy Car Show: At this point, the renewable-energy car show will feature 14 vehicles (mostly all-electric) from these 8 makers: British Motor Works, Chevrolet, Fiat, Ford, Mitsubishi, Nissan, Tesla and Toyota. There will be three Teslas, including a Roadster. And there will be an all-electric bus and an all-electric refrigerator truck. Bike Show: Bicycles as Alternatives to Automobiles: At this point, local bike shops will provide cargo bicycles (plus trailers), folding bikes, regular bicycles, and tricycles set up for carrying awkward loads. Pedal Junkies will provide the drivers for rides to children around the grounds on cargo bikes. There will be 2 and 4 passenger bikes and possibly a couple of electric bikes. We make our home a newborn world. 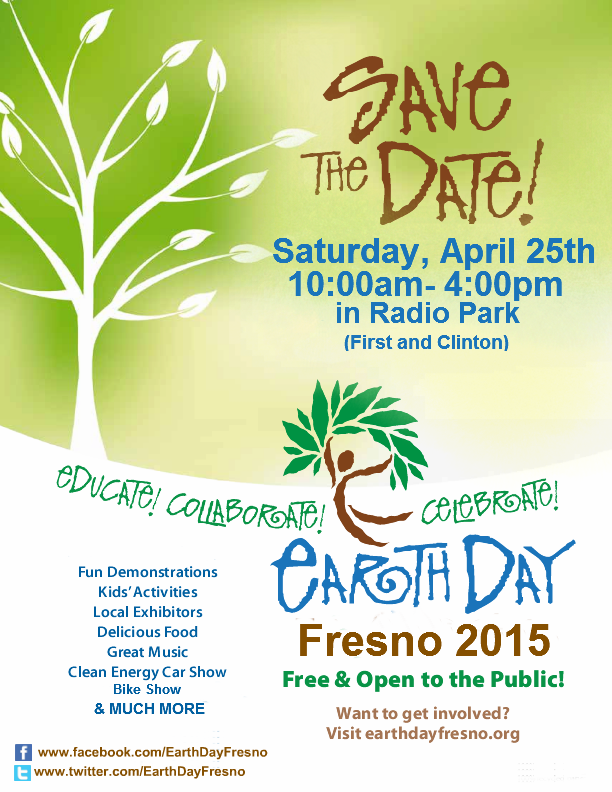 Or, you can hum along with the kids as you view this video which is used by permission from Earth Day Fresno. April 11, Saturday 8:30 a.m. – 11:30 a.m. (Free Event with Zoo admission) America’s Party for the Planet and Breakfast with the Animals – Fresno Chaffee Zoo, 894 W. Belmont Ave., Fresno, CA 93728. For more information call (559)498-5921. To order tickets go to www.fresnochaffeezoo.org/events.html. April 18, Saturday 8:30 a.m. –1:00 p.m. (No charge) California State Parks Foundation’s 17th Earth Day Restoration and Cleanup – Millerton Lake State Recreation Area – This year’s project this will consist of the construction of two life jacket loan stations, the planting of drought resistant trees and general park cleanup and improvement. To register to volunteer, visit calparks.org or email them at earthday@calparks[dot]org. April 22, Wednesday 10:00 a.m. -1:00 p.m. (No Charge) Earth Day Fair at CSU Fresno -Memorial Garden in front of and east of the Kennel Bookstore – There will be educational activities and non-profit booths in addition to food vendors and some local product vendors. There will also be a variety of student clubs and organizations to share their role in the dynamic field of sustainability. For more information, contact Criss Wilhite at (559)240-9662 or Kassandra Hishida at keh511425@mail.fresnostate[dot]edu. April 24, Friday 9:00 a.m. – 5:00 p.m. (Registration: $10, includes lunch) How Blue is Your Valley? Your Voice, Your Future: A Community Conference on the Future of Water in the San Joaquin Valley Fresno City College, Old Administration Building, Room 251 -Keynote speaker: Mark Arax, author and journalist. Panel discussions of the human right to water, fracking, Valley Fever and California’s new groundwater law. Register online at: environmental.calbar.ca.gov/#bluevalley. For more information, contact Gary Lasky at datanations@gmail[dot]com. April 25, Saturday, 11:00 a.m. to 5:00 p.m. (Free admission to the museum) Family Day at the Fresno Art Museum Radio Park in Fresno (First & Clinton)Family Day at the Fresno Art Museum is community-building, a cultural event that is fun and educational, to be enjoyed by the whole family. It is an enriching experience that is meant to inspire, engage, awaken artistic interest, and educate. Family Days are public events and occur three times a year: in the spring, fall, and during the Holidays. This Family Day is in support of Earth Day at Radio Park. April 25, Saturday, 10:00 a.m. to 2:00 p.m. (No Charge) Earth / Arbor Day – St. John’s Riverwalk Park (Ben Maddox & St. Johns River) in Visalia – This year’s event will focus on sustainability, conservation, and energy efficiency and will include live music, exhibitors, vendors, food booths, multiple demonstration workshops and a number of community enhancement “Pay It Forward” projects. For more information, go to their website. May 1, Friday, 10:00 a.m. to 2:00 p.m. (No Charge) Earth Day Celebration – Porterville – Prospect Ed Center, 645 N. Prospect Ave., Porterville – If you are a member of the community, a teacher interested in bringing your class or a presenter with an earth-friendly/living-thing-friendly idea to share, contact Steve Reynolds, (559)782-7095×611 or sreynolds@portervilleschools[dot]org.